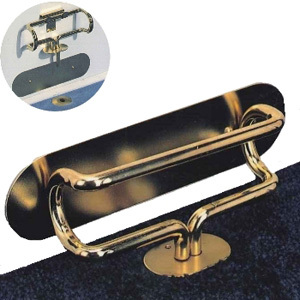 The Door Club comes complete with all the necessary hardware to effectively secure any door in your home and is one of the strongest anti-burglar devices available. 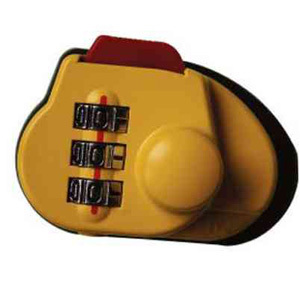 Resists over 2 tons of direct force, keeping burglars from kicking the door in. 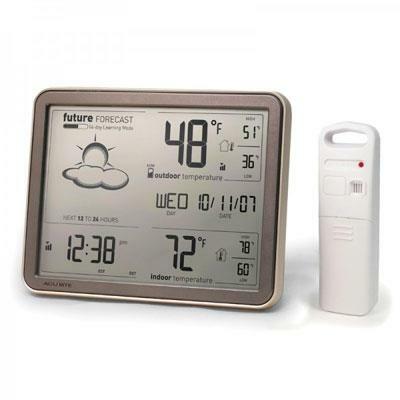 View Visitors with confidence and security. Also an attractive accessory to your door. From the makers of the Original Club - Accept no Imitations! 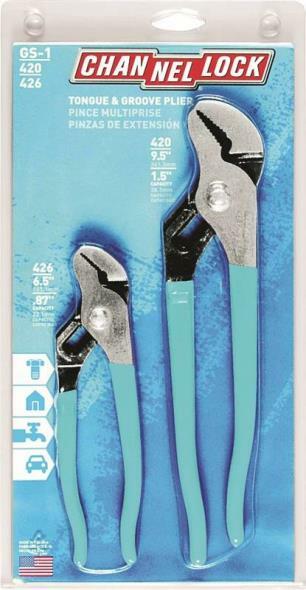 Stop professional thieves and joy riders from taking your vehicle with The Club Premier Twin Hooks. With a new and improved lock housing, The Club Premier Twin Hooks locks on to the steering wheel, making the vehicle impossible to steer. The concept: "If you can't steer it, you can't steel it". Protective vinyl covered 14" cable reduces accidental or unwanted use of firearms. 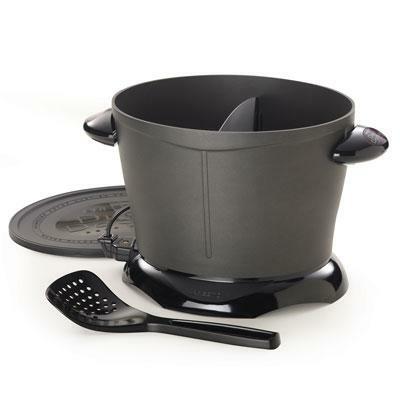 Made of flexible woven steel cable. Fits most handguns, rifles and shotguns. Designed to fit most rifles, shotguns, and handguns, this trigger lock from The Club is an ideal way to ensure gun safety in the home. When properly placed on the trigger, it keeps guns secure by preventing the trigger from being pulled. 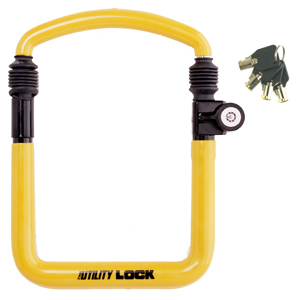 Simply insert the lock through the guard in front of the trigger to stop it from being pulled. 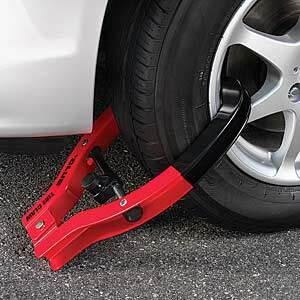 Protect your trailer, ATV, car or truck with The Club Tire Claw XL. 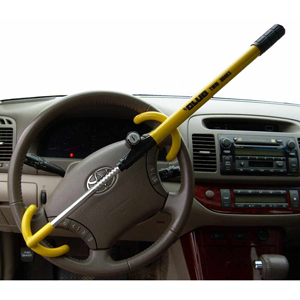 From the makers of The Club steering wheel lock, the The Tire Claw XL works by locking around the tire of the vehicle, making it impossible to move. If they can't move it, they can't steel it. 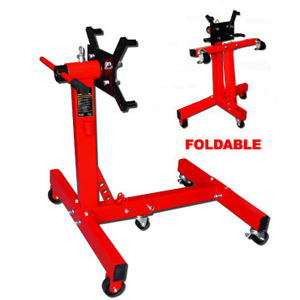 This makes The Tire Claw XL ideal for recreational and industrial trailers, ATV's, small vehicles, boat trailers, and motor home trailers. Self locking Installs in seconds! Black Vinyl dip to protect wheel rims. Plastic cover protest the lock from elements. Most cars, trucks and vehicles with a tire width of 12 inches or less. 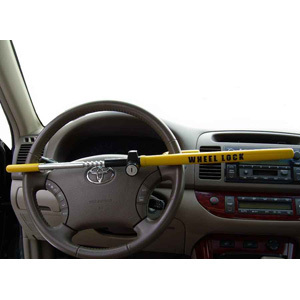 Stop professional thieves and joy riders from taking your vehicle with "The Club" steering wheel lock. Made in yellow for high visibility, The Club Twin Hooks locks on to the steering wheel, making the vehicle nearly impossible to steer. If a thief can't drive it, they can't steal it. 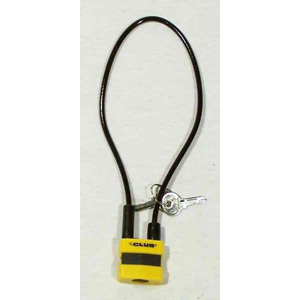 Stop professional thieves and joy riders from taking your vehicle with The Club Brake Lock. 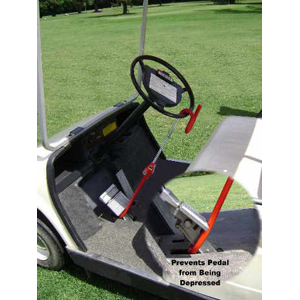 The Club Brake Lock attaches to the brake pedal, preventing it from being used. If you can't use the brake, you can't drive the vehicle. The concept: "If you can't drive it, you can't steel it". 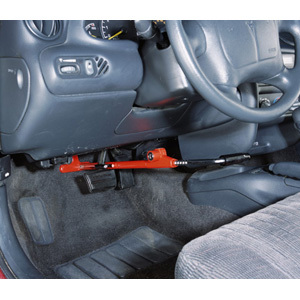 Attaches the steering wheel to the brake or clutch pedal, making the vehicle impossible to steer and/or stop the vehicle. Fits most cars, vans, and small trucks/SUVs. 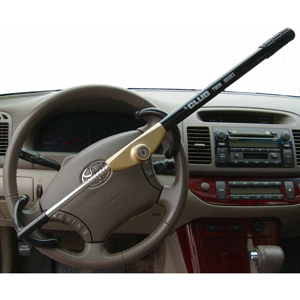 From the makers of the Original Club steering wheel lock -- accept no imitations! Help deter auto theft with The Club Vehicle Security Decal Set. The CLUB Vehicle Security Decals attach to the inside of the vehicle windows. Would-be thieves see the decals and assume an alarm is installed inside, thus causing the thief to look elsewhere for an easier target. 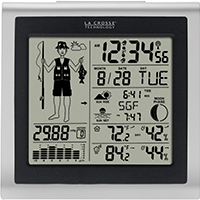 THIS PRODUCT INCLUDES DECALS ONLY, AND IS NOT AN ALARM. 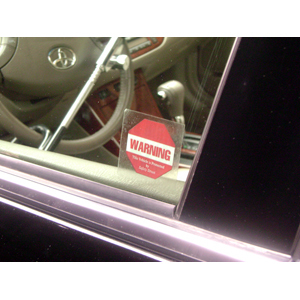 Note: It is recommended that the decals are removed from the vehicle upon any sale or transfer, or that the buyer is notified that these are not a security system or alarm. 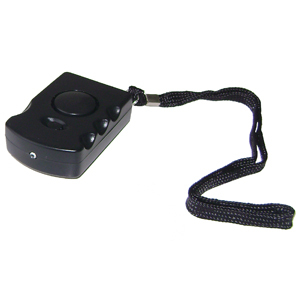 Great for jogging, bicycling, walking, camping and other outdoor activities, The Club-brand HELP ME personal alarm helps ward of attackers by sounding a high frequency audible alarm when the strap is pulled. This alarm could warn others of trouble, scaring off an attacker. 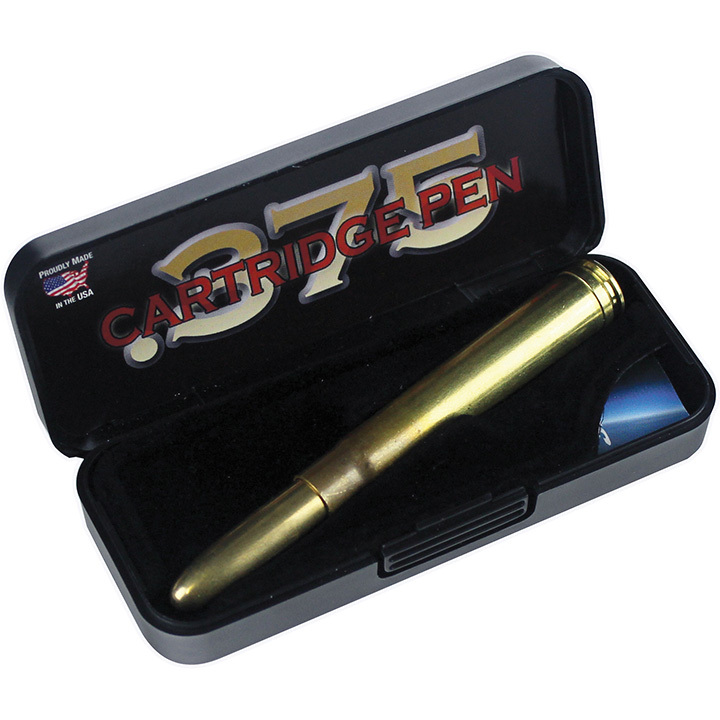 Note: This product uses 1 size A23 12-V battery, which is included. User will need a small Phillips-head screwdriver for installation. Prevent Motorcycle theft with The Club Motorcycle Anti-Theft Utility Lock. Fully-adjustable to eliminate "dead space" within the lock. Steel gusset on the side of the lock housing prevents pipes from being used to pry the lock. Grand Theft Auto V PS4 Reorder SKU. Does not include the preorder bonus. This item cannot be shipped to APO/FPO addresses. Please accept our apologies. Golf Cart Spinner 29.5 x 35 in diameter: 12 in. Smaller and less detailed than our WindGarden spinners, but just as eye-catching, new Accent Spinners utilize brand new hardware and fabric. SunTex is a revolutionary 210D polyester fabric with added density available only from Premier. It provides bright colors, durability and UV resistance that is far superior to other spinner fabrics on the market, and second only to SolarMax. For customers who love Premier spinners but shy away from premium WindGarden pricing, our new Accent Spinners provide an affordable, yet durable, alternative. Cannot be sold into Canada.